Hi! 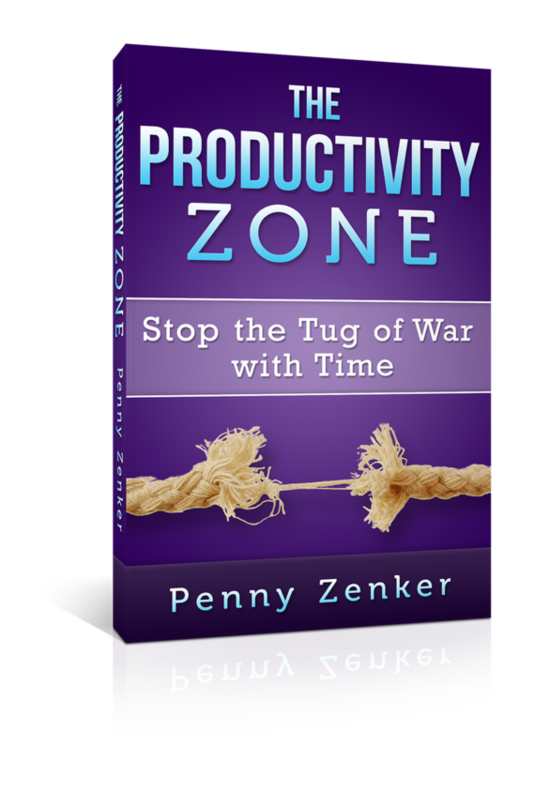 It’s Penny Zenker your host of take charge of your productivity. On this show we explore your greatest potential by tapping into the ten core elements of time and energy management. To simplify how these ten critical elements are required for quantum growth and how they come together, I came up with a windmill as a metaphor for human productivity. The windmill has a gear mechanism that works from within. The smoother the more consistent and the faster the blades turn, obviously the more productive you tend to be. This week we are talking about winning strategies which is blade number two of my windmill. Working smarter not harder is how you take your business to a whole new level. It’s about becoming the owner of your business and getting out of your own way. Getting out of the role of operator. As an operator, you get lost in the day to day. You are really not able to take a step back and take a look at the strategic direction and positioning of your business from this outside perspective. In my quantum productivity program, this section reveals the best practices behind the three elements that make up winning strategies. Planning, Process, and Priority. I am going to be joined today by founder of CEO Space Berny Dohrmann to discuss his strategies for success. Today on our show you are going to learn what makes a great business strategy and what might be holding you back. The impact of networking and mentoring it can have on your business and building it quicker and smarter. Lastly, why staying current is key in developing your company’s productivity. The last 30 years Berny Dohrmann who is often referred as the millionaire maker has been known as the coach of coaches. He has coached Anthony Robbins, Jack Canfield, Lisa Nichols, Robert Allen, and many, many more. Big names that you can think of including founding partners of lead consulting firms. Also, companies like Starbucks, 3M and many more. He is now counselling the United Nations and other nations in regards to turning around the global economic crisis via cooperative capitalism. He just finished helping the US Senate with the language also known as the Crowd Funding Bill. Bernie Dohrmann is an internationally recognized capital strategist revenue accelerator and economic innovator. He is the founder and chairmen of CEO Space International the world’s leading small business incubator having touched over 300,000 business owners in more than 100 countries. Under Dohrmann’s leadership, CEO Space has grown into a tradeshow that services small businesses owners five times a year. He utilizes propriety networking and teaching techniques that accelerate attendee’s abilities to grow their business through capital raising strategy, business growth intensive and demonstrating a power of collaboration. Berny, I could go on and on and on with your background and accomplishments. It is such an honor to have you hear today. Welcome. B: It’s my pleasure. I can’t wait to help just that one person. You who is listening to give you a solution that can help you today. That is my goal. P: I think there will be more than just one. So, first, I wanted to ask you, I understand that your father was a mentor to Disney, Napoleon Hill, JFK and a whole host of other amazing iconic leaders. What was it like growing up in a household where you sat down and had exposure to all of these great innovators? B: It was just like growing up in Leave It to Beaver. I was one of nine children. Dad would hold court and the leaders of the century were there, all of them. Napoleon Hill, Earl Nightingale, Zig Ziglar. I was there when Zig Ziglar had just started. But I didn’t know as a little boy. I came in and sat on their laps. They would mentor me and I didn’t even know it. Uncle Zig was just in my life. We were playing and yet being shaped to carry on this work. It was really amazing looking back at it. P: Tell us a little bit more about your background. I know that you have also had some bumps in the road. What were some of the greatest challenges? B: Well, I have two careers. I was groomed by the Witter Family who owned Dean Witter to be an investment banker. I had public investment companies from my 20’s all the way up to when my Dad got ill with cancer and I sold my last investment company. It was large and it was thousands of stock brokers in 14 countries publically traded. I sold it to take care of my dad. Years later, I got indicted for $85,000 on a junk bond we had sold years before for the risk they felt we should have known but didn’t know at the time. We were still held responsible for what we should have known. We really couldn’t have known. When I sold the company the bond was fully paid and performing and continued to be paid and it defaulted later. I was retroactively held responsible for that later default even though the company was sold. I thought that was wrong. The prosecutor was my best friend who I grew up with in private school who knew my dad and family. He prosecuted me before he retired. They are making a movie called Malicious Prosecution which everybody can see the trailer at LSAPublishing.com. We just got the agreements for doing that movie through them. We are pretty grateful. Now that movie has got car scenes and murder scenes that didn’t happen in my life. My life was pretty boring actually but you know it was wonderful to be in that Wall Street group. They still treat me as royalty. And I am grateful for my privilege of knowing that industry. P: What is the gift that came out of that challenge for you? B: I think that when you can forgive. Forgiveness for your biggest betrayal and injustice. God had a greater plan for my life than I ever had. I would have never have the bestselling books, movies, and the stature with nations. I have more public companies, heads of big companies today all of these years. This happened more than 25 years ago but I have current CEO”s come to me and say how do I bulletproof myself? They would say I had such an unjust thing happen how do I make sure that doesn’t happen to me? I wouldn’t even know how to council if that hadn’t happened to me. So I helped keep them bulletproof under all these new regulations that are in place today and growing and they don’t know what to do. They don’t know how to do it. Their lawyers often don’t know how to do it. I advise a lot of law firms on how to make sure you never have a bad hair day. And we call it over compliance. Don’t comply, over-comply. It’s easy, it’s not hard but it takes a detailed part of your business to keep watch on. For larger business it is the Holy Grail. P: Is that where your passion from education came from? B: No, my father had cancer and he had a big educational company on performance training for the largest companies in the world. I grew up with the heads of these companies. No one could run his international educational group but his oldest son when he was ill. So I did that with him until he passed and then I ended up out of the investment business as the economist and investment banker. I entered the training business which I have done for 3 decades just helping small business owners to have the tools and the backing that they really I think, not having education provides them with the tool set, they do a lot of things right in just the wrong sequence. So we re-sequence them and they just take off. They just go into hyper growth and stay there and giving, I have found that entrepreneurs aren’t born, they are made. Anyone can learn how to maximize job creation and self-employment if their desire is to be entrepreneurial. P: That is really interesting. You provided that amazing skill set. B: I cheated, I think. Over my Dad’s whole life I witnessed collaborations in the workplace. I watched them model every increasing performance and how to get change to work better and smarter and have more fun in the process and turn out more for everyone. And that became the pride of what we have today as a lifestyle. The world is rising up to it everywhere. So we just took it to the next level and continued tweaking these wonderful toolsets and because of my investment background I always thought of all of that as shareholder value and how to create proper stakeholder values for all concerned and make the most ethical, exciting, vibrant, thriving workplaces. I modeled along Zappos, Google, Pinterest, Apple and the cool companies that are really treating their people with a different architecture and showing up with the performance. P: It’s almost like there were so many different pieces of the puzzle that this all came together. B: I have decades of experimentation. Trial and error and seeing what does work and keeping that and then adding value to it. P: You have been around all of these leaders as mentors, how important is it for entrepreneurs to have mentors? B: I use the phrase mentors make millions, coaches do not. I think all coaches should rise up to become mentors and mentors make millions. A coach making $70,000 to $150,000 have limits on how they can bring an entrepreneur to an income higher than they themselves make. They don’t make enough money or they don’t know how to or they would to guide the person who is paying them to the level they want. First of all, we have to shed and build businesses based on values. Businesses should not be based on money and greed and private acquisition. It should be the law of accumulation that occurs because we are passionate about serving others. Having our products and services reach the maximum number so everyone else is benefitting from our genius. When you put that perspective into what you are doing, everything else is just organizing principles to get there in the most efficient way. To ramp up into hyper growth so others enjoy your game or genius. That is the game. Let me make it efficient with system management. What we need to do is teach the entrepreneur skill sets. A sobering statistic. In the largest school district in the US, Tampa Bay and L.A. 52 to 54% of the students in high school are not finishing high school. Now, when they drop out, 82% in 120 days have started their own business. So, these uh, they can’t get jobs, but they figure out through the internet how to train themselves how to own a business, and they are not finishing school. In the age of the entrepreneur where more than half of the jobs are self-employment, why aren’t we teaching entrepreneur’s skills to a little girl where more than half are women who wants to own the restaurant not work in it can learn how to do that. We don’t teach them. I am really pushing education and insert entrepreneur skills from K to 12 all the way up and you will see learners who will stay in school and you will be teaching them what they really require to prosper and survive in the landscape of the entrepreneur age we live in. P: They will see the relevance for their life. B: We have a monopolistic system that old publishers have put together to make sure there books come down the conveyor belt at billions of dollars a year in which a consolidate group of less than 5 publishers own. We need to reform education. They need to be put out to pasture. Our people need to learn things like what does it mean to be American? We used to have a category called citizenship. We would have less crime, less acting out, less violence because we knew what it was to be a citizen with each other. Why did we stop teaching that? Insert things like a bunch of memory details, I just don’t get it. P: Along that same line, but on the business side, I know you have coined a phrase, the cooperative capitalism. I just wanted to talk about what is cooperative capitalism? B: Presently in the US, in my book, I quoted it several times and have used it with negotiations in Syria so we didn’t bomb them. To break out cooperation and stake out houses all over the world. It’s not communism or socialism because that is competitive bureaucracy. It’s worse than competitive capitalism. Basically, competitive capitalism creates a system where 1% own more wealth than 99%. That always melts down into world war. If you study it and know it, why would you want to do that again? If you could have a better model of what it would look like, it’s a model where everything in your financial system is public and recorded and there are no secrets. Everybody has ethics and integrity and the regulations moderate greed. You have free ownership and pride of ownership and workers make enough money to have dignified lifestyles which is important. In competitive capitalism, we use a pyramid. We use a management system. A system that works on punishment and exploitation. At the top is fear and at the bottom is punishment and in the middle is the compression of exploitation of the worker. What we want is the system that is built on full partnership and that is a circle like a wagon wheel. Hub management at Zappos, pushes out on all of the spokes and divisions for outer wheel momentum. That is true for a dentist office or a family. The breakdown you are having is because of the competition itself. The idea that competition is good and from God is one great lie. Everything about competition should be looked at on the other side. When you die and go to the other side, do you think there are gnashing teeth and snarling and doing competitive stuff or do you think it’s all unconditional love and cooperation? We create our own hell by competing. Stop competing with other spirits. In a cooperative system you have more production and performance. In a competitive system you have much less. The issue gets to be what do you want? A more cooperative or a more competitive system? And you can start making your adjustments by reading my book. I mean, read Redemption, the Cooperation Revolution if you just want sweeter language in your home. Better retention of customers and repeat buying and more referrals, then get everyone in your employee group to read Redemption and have meetings about it. Reform your workplace to a cooperative system management. P: Let’s take a break. Stay tuned because we are going to talk about productivity in the next segment.